This is Ncamsile. She is an employee at Cabrini Ministries. She is HIV+ and 29 years old. Ncamsile discovered she was HIV+ in 2004, when she was working as a teacher, and found one morning she could not get out of bed. This is often the case in Swaziland- people do not acknowledge more subtle signs and symptoms of disease, and often seek health care only when gravely ill, probably because of a lack of health knowledge and the lack of a reliable system from which to receive care. Ncamsile’s CD4 (or T-cell) count was only 100 when she first sought treatment, which is considered late-stage AIDS and is a life-threatening level of illness. Her sister came in for treatment as well, Sr. Diane went out to see and try to treat her, but she passed away soon after. Ncamsile also lost another sister and brother to the disease. Ncamsile is responsible for raising her sister’s two children who were orphaned now. Once she was on ARV treatment, she responded very well. She had to leave her job and recuperate for a month until she felt her health return. When she felt well again, she applied for a job at Cabrini Ministries; we hired her in February of 2005. At first she worked as the residential manager of the hostel, then she got more and more involved with healthcare. She also began to disclose her HIV+ status publicly. Swaziland is a country where HIV+ status has been highly stigmatized, especially in the more traditional, rural areas. Even though many people have become HIV+ and died of AIDS, people avoid talking about it directly, instead saying that a person was “very sick” or had “the plague”. Shame, fear and ignorance keep people quiet about HIV/AIDS, and it has the very detrimental effect of delaying important preventions like testing and treatment. Ncamsile is the first person that has revealed her status in the local area where she was well known. This takes so much courage and self-esteem and we respect her so much for that. Because she has been willing to disclose her HIV+ status, she has become what is known as an “expert client”- someone who can speak from their own experience to others about living with HIV/AIDS. When she speaks, the community listens. Because she is a local Swazi, her voice has much more authority than even a nurse or an outsider. We are in the process of developing a formalized community health education program, and she will head that up. It is people like her doing community education that destigmatize HIV/AIDS and help save people’s lives through sharing information. Also the naturally forming communities we see in our healthcare department, such as people riding together in our vehicles to get treatment, coming together at the walk-in clinic to get ARV treatments, or coming to get food parcels at the same time, are a naturally built open support system that helps patients to share their HIV status and actively seek care without shame. As an employer, Cabrini Ministries has an attitude of affirmative action for people living with HIV/AIDS. When we have a job position open, and two equally qualified people apply but one of them is HIV+, we would choose to hire the HIV+ person. There are a few reasons for that. First because HIV/AIDS strikes the young, working population who are usually the main breadwinners for the whole extended family. The person’s family has probably already been undermined by the person’s illness. Also, we can never overlook the importance of psychosocial support. The HIV+ person needs to have meaning, purpose, and hope in their lives to go on, and one of the things that gives anybody hope is a job. If you have a healthy person and a person who thought they were going to die of HIV/AIDS, a person who thinks they’re going to die needs more hope and things to give them hope. Ncamsile recognizes the importance of sharing her experience with her community, and works at giving all she can to the orphans she raises at home and in the hostel, and to the patients that are sick like she was in the past. 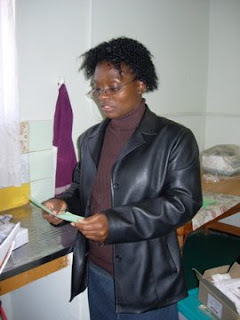 Our employees at Cabrini Ministries like Ncamsile are a part of a living cycle of change, regeneration, and hope. Thanks to everyone that keeps the spirit of such good work alive everywhere out there and at Cabrini Ministries here.